The construction industry is often faced with numerous challenges, from sourcing quality materials to building within a time frame, which meets not only all building code regulations but their client’s expectations. It is also essential that these building materials are very durable not only during construction but well after completion. This is particularly pertinent when constructing projects such as road bridges, residences, commercial offices, wharfs and even mining sites. There are also many regulations associated with the construction industry and one in particular is related to noise transmission, which is in place to ensure liveability. It is important to make certain that this issue is addressed during construction to avoid issues in the future. hazardous road oils and grease. Reglin premium rubber products are a durable long-lasting building material for flexible construction applications. RIGID INFLEXIBLE CONSTRUCTION MATERIALS: Most building materials used in construction such as concrete, steel and timber are very rigid and are often connected together using inflexible fixings. Imperfections in the surfaces of these materials combined with their varying expansion and contraction characteristics, as well as natural movement under load and external forces, often causes a requirement for a flexible isolating material to be used between them. Why use rubber? Rubber is the ideal solution for many of these applications because of its flexibility and compressibility combined with physical strength and load bearing capability to create a long-lasting flexible construction joint to withstand these movement conditions. Read more about our solution Using Rubber As a Flexible Building Material for Construction Joints, tab here. AUSTRALIAN NOISE TRANSMISSION REGULATIONS: Multi-story commercial and residential buildings are required to meet strict noise transmission regulations. New buildings are required to meet regulations for the sound insulating rating of floors as set out by the Building code of Australia (BCA). To assist in achieving this standard, it is critical that construction joints are isolated to reduce noise during movement of the structure and also insulated to ensure noise does not travel through gaps between structural components. Rubber can be used as a compressible isolating strip between many construction materials to absorb the movement of the rigid building materials. This strip can also assist with reducing the creation of noise and act as a seal to insulate against the penetration of external noise. WEATHERPROOFING AND INSULATING: It is imperative in all construction, that new structures are sealed against external environmental effects. The most common of these is the weatherproofing of new buildings. Rubber and Sponge products are both extremely flexible and compressible and can be used to seal gaps throughout building construction to ensure the structure is weatherproof. CRITICAL TIMEFRAMES: Construction projects often subjected to critical timelines as mentioned, so it is imperative that stock is readily available for prompt delivery. 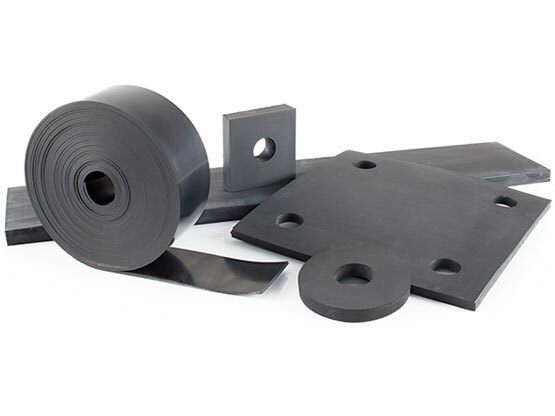 Reglin Rubber have large stock holdings of their premium construction rubber products and have the ability to supply custom cut strips, pads and gaskets quickly to meet urgent demands as well as ongoing scheduled deliveries. Reglin Rubber supply a range of durable premium rubber sheet products to suit the demanding long design life requirements of the construction industry. These products are designed to last against UV and weathering and in a range of bearing and sealing applications and can be supplied in varying thicknesses, sizes and harnesses depending on service requirements. Reglin rubber sheet can be supplied in rolls, custom cut strips or pads to ensure easy installation on site and to meet the particular requirements for the application.